White Horse (40.0%): I remember my grandparents being deeply involved in politics throughout seventies. They simply loved to discuss and argue about, watch every debate, TV show and follow columnists on the newspapers. The symbol of the political party they were supporting was a White Horse. 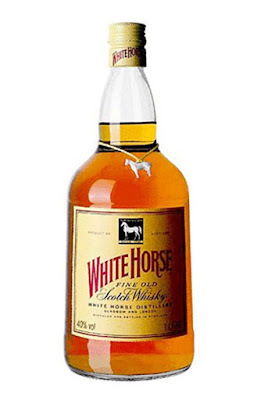 All my parents' friends and our relatives used to bring them the little white horses taken from the necks of the White Horse bottles as a joke. So, needless to say they had quite a collection... That's how I first got aware of the brand almost 35 years ago. The whisky contains 6/10 grain and 4/10 malt whiskies in the blend and the heart of the malt component supposed to be Lagavulin and Linkwood. The blend is distributed worldwide and a bottle costs just a little more than $20 in US depending in which state you are. A great value blend to review for our blend project. Too bad that they don't have the little white horses around the bottle's neck anymore though... Color: Pretty generic caramel coloring, clear medium amber. Nose: They were not kidding about Lagavulin. Young peaty Islay malt aromas with sweet oatmeal cookies and bartlett pears. Young grain whisky almost like white spirit and fresh cut grass. It very much reminded me the Black Bottle minus the salt. Palate: Grain whiskies are more dominate on the palate. Damp garden soil, subtle vanilla and cookie dough. Purple basil, parsley and fresh sage leaves. Thin but smooth and velvety mouthfeel with very pleasing honey notes. Finish: Longer than anybody would expect but I mostly give it to the young grain whiskies in the blend. Overall: It is a whisky showing all the mediocre characteristics of its price range but I really liked the old fashioned feel and peatiness of the blend. It is a decent whisky nobody can complain about after paying only twenty bucks and change. It's not my favorite one in the blend project so far but surely secured its place above some others.